Beginning as early as mid-September, crews will start support of excavation work (shoring) at the main entrance site of the future Chaplin Station. The main entrance is located on the northeast corner of Eglinton Avenue West and Chaplin Crescent. Shoring is a common step in the process of constructing the foundation of a building. Steel piles, braces and tie-backs will be installed around the perimeter of the main entrance area to support excavation. This stage will take approximately eight (8) weeks to complete. In late 2016, shoring of the station box, within the roadway, is expected to begin for a period of approximately 20 months. Please note that the ongoing Bell utilities relocation on the south side of Eglinton Avenue West will continue concurrently with shoring activity for approximately five (5) weeks. This work will be conducted Monday through Friday between the hours of 7:00 AM and 11:00 PM, with crews working until 11:00 PM on a regular basis. The contractor may not always work during the permitted evening hours, but may do so at its discretion. Nearby residents and businesses can expect increased noise in the area caused by a pile drill, crane, loaders, trucks and other construction equipment. In addition to construction activity, residents can expect to see equipment and material storage within the work zone. 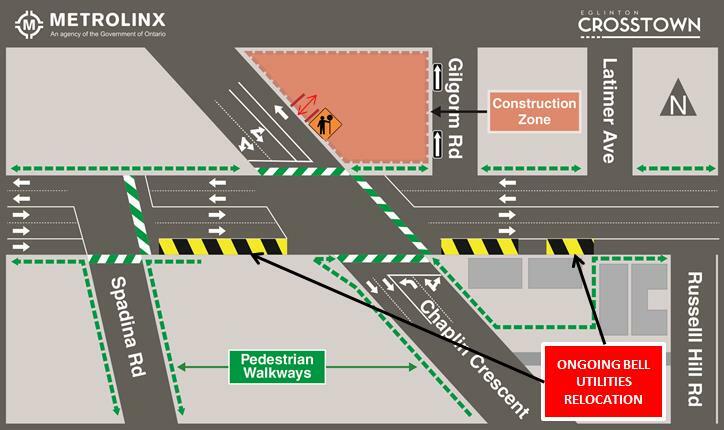 The existing pedestrian rerouting around the Toronto Fire Hall on the south side of Eglinton Avenue West will remain in effect. Truck traffic will enter and exit the west side of the work zone from Chaplin Crescent. To accommodate ongoing work at Chaplin Station, one (1) TTC bus stop, on the southeast corner of Eglinton Avenue West and Chaplin Crescent has been relocated approximately 120 meters to the east. Additionally, one (1) TTC bus stop on the northeast corner of Eglinton Avenue West and Chaplin Crescent has been temporarily removed for the duration of station construction. The next closest available northbound stop is located approximately 60 meters south of Eglinton Avenue West on Chaplin Crescent. Please look for signage informing passengers of the new temporary stop locations.